If you've been considering bathtub refinishing cost versus that of a full replacement Miracle Method can help you make the decision. The National Kitchen and Bath Association recently estimated that a full bathtub replacement can cost well over $3,000 in labor and supplies. 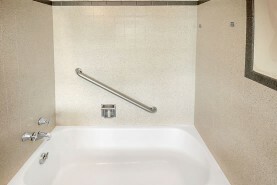 Performing a total tub replacement yourself means investing far beyond the cost of a new tub. Replacing a tub is far more complicated than a simple swap out; a decent amount of demolition is required. Plumbing and drain fixtures have to be removed and the surrounding flooring most likely will have to be redone. 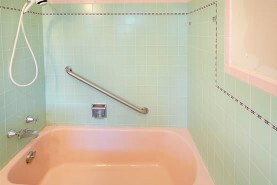 In many cases the tub is framed in to the wall, requiring partial demolition of the wall to facilitate removal. If you have a bath and shower combo the demolition can be even more extensive. Once your tub has been removed from the wall it has to be hauled away. Often, to get the bathtub out of the bathroom the tub has to be broken into several pieces and fees paid for its disposal. After the demolition is complete you'll likely be left facing a messy construction and cleanup project. Instead of spending thousands and investing weeks of time, Miracle Method can refinish your bathtub for a fraction of the cost. Not only can this save you up to 75% of replacement costs, but it can be completed in a matter of a few short days. Just because your bathtub is chipped, cracked or worn out is no reason to replace it. Even if you've always hated the color; don't replace, simply refinish. The Miracle Method refinishing process uses a special repair process to repair and smooth over any cosmetic damage to your tub giving it a like-new appearance. Once the cosmetic damage is repaired a final finish available in dozens of colors is expertly applied. When your tub is finished, it's nearly impossible to distinguish it from a brand new one straight off the showroom floor. If you've been considering replacing your bathtub, don't waste thousands on a total replacement. Contact Miracle Method today to make your bathtub look and feel new. Click Find a Location or call 1-888-271-7690 to find a Miracle Method location near you.